We’re coming up on the end of July, and with that, it means back-to-school season! This season always means a lot of changes. For example, I always have to take time to get organized again! I am a huge planner nerd, but I tend to spend the entire summer being spontaneous and not writing anything down. As August looms, I know that my schedule is about to get hectic again. That means, I need to get back into the habit of daily planning, and remember how to use a planner to stay productive! This post contains affiliate links. To learn more about what this means, please read my full disclaimer here. I know. 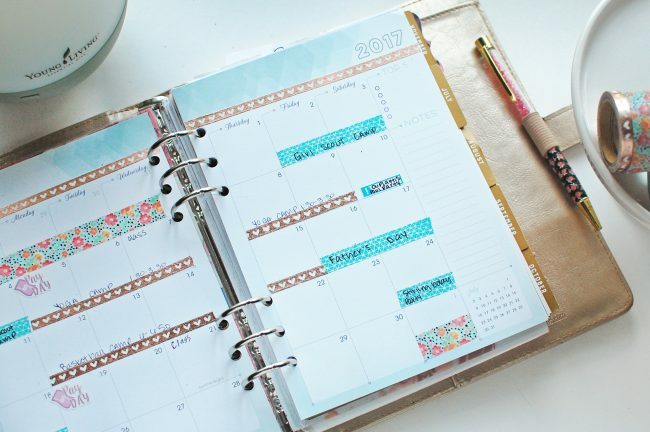 You’ve tried using a planner before, and it just didn’t work for you, right? You weren’t more productive? Sometimes, the problem isn’t with planning in general, but with the planner you chose! 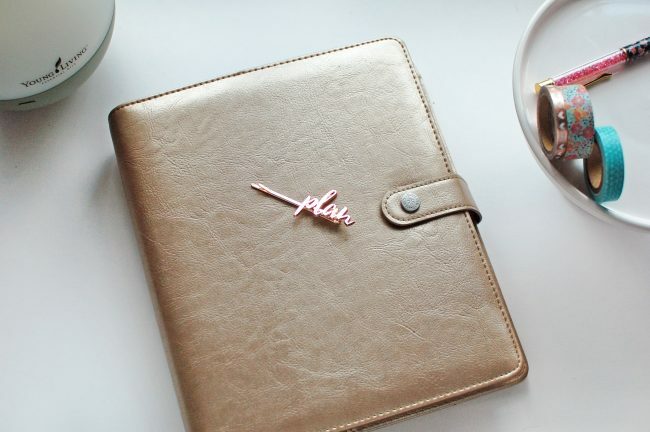 Everyone’s life is different, and planners aren’t one-size fits all. 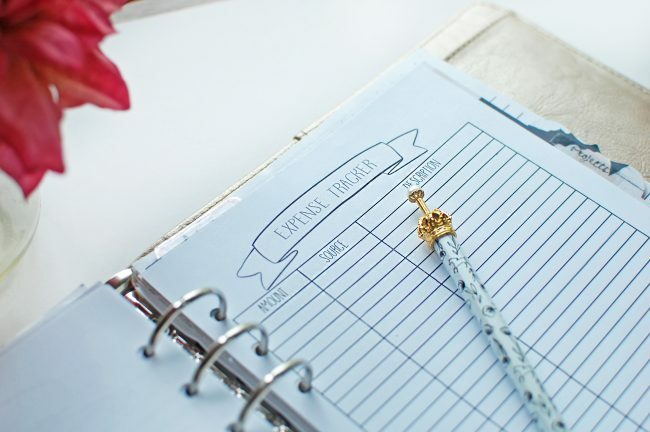 It’s important to find a planner that meets your specific needs, otherwise, you’ll be trying to force it to fit your life! Take the time to shop around and find a planner that meets your specific needs. If you need help finding a place to start, my favorite planners are Inkwell Press (classic, A5) and the Erin Condren Life Planner (vertical). Before you buy, though, let’s chat about some things that might get in the way of your planner productivity. 1. Find a planner that fits your needs. There is no shortage of planners on the market these days, and they all have different features. This is because everyone wants something different! Are you a goal setter? A list maker? Maybe you need space for brain dumping? Are you a stay-at-home mom? Do you run a business? All of these details play into what sort of planner you’ll need. Take some time to look at the features of each planner you like and pick the one that you think will work best! Trust me. It’ll save you loads of time trying to make something work. 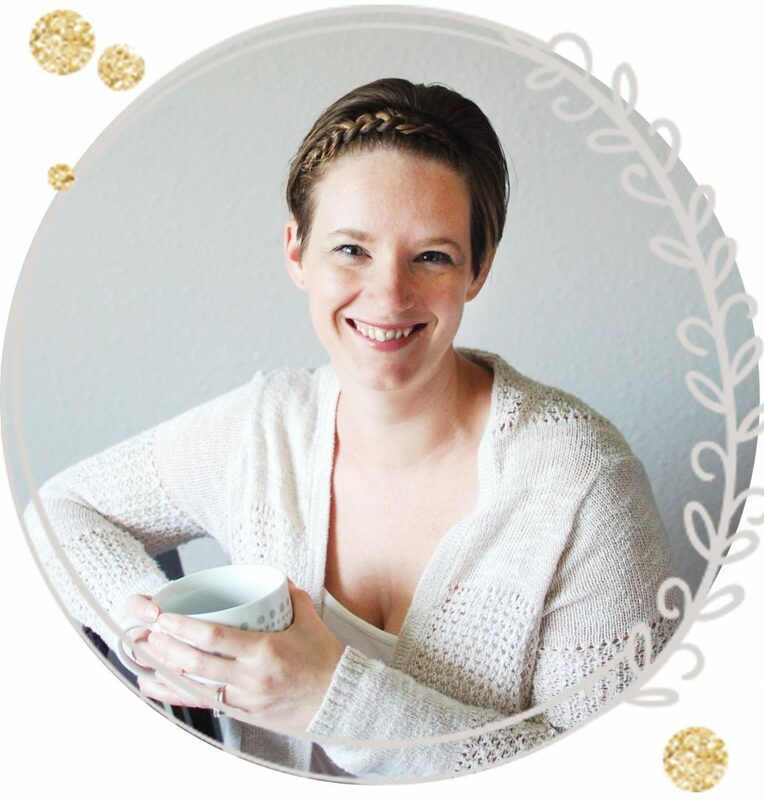 For me, I’m a work-at-home mom that sets lots of goals and likes to prioritize my to-do lists. I found my planner peace when I bought my first Inkwell Press planner. I knew I’d finally found a planner that could work with my lifestyle. Still, there were things missing that I thought would really benefit me for my business. My solution? I switched to an A5 ringbound system and added some pretty printables that filled the gaps! If you look up how to use a planner on Pinterest or in planning groups, you’ll find tons of amazing information. You’ll also find a lot of people that use multiple planners, have binders full of stickers, washi tape out the you-know-what, and a whole drawer of pens for color coding and decorating. It’s tempting to buy in to the frenzy when you see this. I know I was tempted! I love stationery, and love writing things down. It was only natural that I’d want one of everything! I managed to talk myself out of most of it though, and I’m so glad I did. While I do love decorative planning, my style tends to err on the simpler side. A lot of those purchases would have gone to waste for me. Of course, there is nothing wrong with having a big planner or pen stash if it helps you stay productive. It’s important to remember, though, that the people that have collections this big have been using planners for years, and they know what works for them! Start simple. Figure out exactly what works for you, and go from there. 3. Make sure it has room for everything. Planners are about so much more than just a calendar these days. There are pages for setting goals, pages for tracking your budget, pages for taking notes, and so much more. Consider what you want to keep in your planner, and make sure there is room for all of it in the planner you choose. I personally leave my planner on my desk, so I love having a big, bulky binder. It has my whole life in it, so I need a lot of room. I don’t worry so much about whether it will fit in my purse, because unless I’m having a meeting over something, I don’t bother carrying it with me. Some people like to keep their planners in their purse, though, so a big, bulky binder isn’t the most efficient idea. Think about how you’ll use your planner, and pick a size based on that. 1. It can keep you motivated. It is always amazing to me what simply writing things down can do. Once I have a physical plan in place, I am so much more motivated! Seeing everything laid out can really help me figure out what the first step will be, and I’m able to develop a plan to help me finish my tasks or reach my goals. 2. A planner can organize the chaos. I don’t know about you, but I keep up with a lot of stuff on a daily basis. It’s up to me to remember the kids’ dance classes, doctor’s appointments, school projects, birthday party invites…you name it, someone is going to expect me to remember it! A few years ago, when I only had one kid that was just barely starting school, I thought the idea of a planner was a bit of a joke. I had a great memory, and didn’t need to write things down in order to keep track. I also had a lot of anxiety, and would write things down over and over in notebooks so I wouldn’t forget what was going on. Pretty soon, things started to fall apart. I would forget a birthday party, or show up late for an appointment. I was losing my to-do lists and forgetting what I needed to do next. The chaos had officially taken over as my daughter entered school. I had more on my plate than ever! Finally, I saw the benefit in using a planner to help me stay on track. I bought my first Erin Condren Life Planner at the advice of a friend and never looked back. Once I learned how to use a planner, the chaos settled down. So did my anxiety, because I was able to look at my plans every day and know that I had it under control. Today, I couldn’t imagine not having a planner to write things down in. I’d probably forget what day it was! 4. Use your planner to track your progress. Are you working on a big goal? You can use your planner to help you track your progress on those goals. So often, I think I’m not making any progress at all. I’ll get down in the dumps, but then when I find myself flipping through my planner, I’ll see just how far I’ve come. The same holds true for those times when I feel like I’m not being productive, even when I feel busy. Usually, I’m able to look back over my planner for the week or month, and see that I actually accomplished a lot. This is actually a big part of how I use my planner for goal setting and productivity! Finding the right planner takes a bit of research, but I promise you, the quest for planner peace will be worth it. 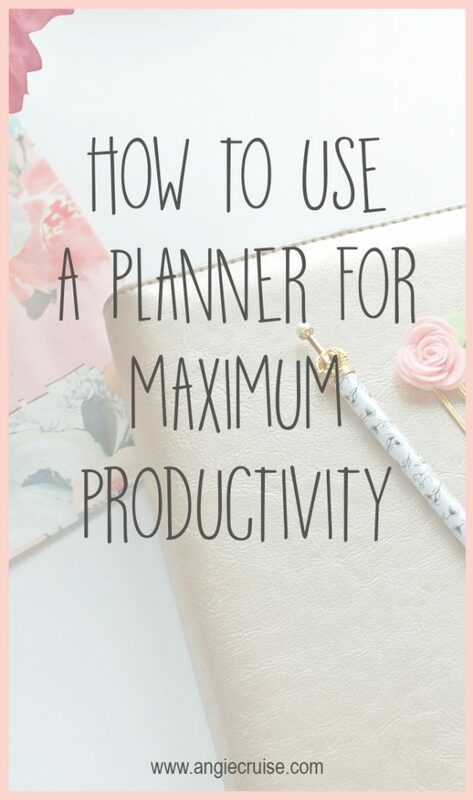 Once you find one that fits your needs, you’ll be able to see easily how to use a planner to be more productive! Do you use a planner? 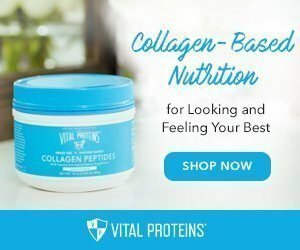 What brand is your favorite, and how do you use it? 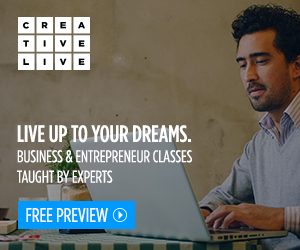 I’d love to learn more! 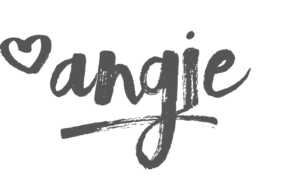 Happy Holidays to you Angie! Just reading your intro has me motivated. I’ve been looking at my Big Happy Planner for 3 weeks now and have not touched it except to buy “stuff” for it.